Welcome to the Skip Hop Nursery Design Event! 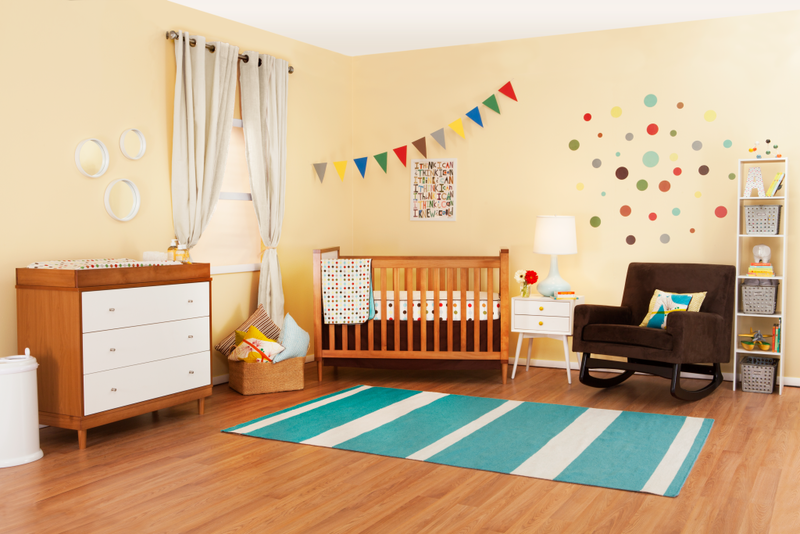 This nursery was designed by Tiffani Thiessen and was inspired by Skip Hop’s Complete Sheet, the Mod Dot Collection. For more information on the design event and for details on how you can win prizes daily click here. The Mod Dot bedding gives off a fun cheerful vibe, so I wanted to incorporate that with the colors and accessories as well. I also wanted the furniture to be simple but modern without taking away from the bedding and it's colorfulness. Mod Dot by Tiffani Thiessen is my favorite room because I love the color combinations and the ‘mod’ accents that are just right (not too overkill)! The mod vibe is so cool! Love those dots! I love the polka dots!!! And where can I get that rocker in pink? Another winning combination of furniture from the Million Dollar Baby family of brands – Babyletto and Nurseryworks What an amazing looking nursery. This nursery would go really well with my airy hot air balloons and kites them for my baby boy to be’s nursery. Love this one, so simple and fun! Cute pieces that can be used as baby gets older. I love the soft yellow walls with the bright pops of accent colors. Beautiful, bright, fun room. Can you tell me where the rug comes from? I like this one because of the bunting! Love this for a boy! It doesn’t scream “boy” but I love it! The flag banner is perfect. I like this Mob Dot by TIfani Thiessen having all the necessity for a baby incorporated into a colorful room . This is the coolest nursery. So cheerful. Love the rocker and vertical storage. I really like this… It looks cute, yet comfortable! The colors are great and I’m in love with the dresser/ changing table! I love this design – simple, uncluttered, practical. Nice work! Really love how you paired the very square furniture with the circular pattern of the Dots bedding. Just wish you had gone a bit bigger in the wall decorations. I like the simplicity. The design elements are not overpowering. This is a lovely nursery with its simple design. The pop of color in the right places adds charm to this room. Love this design! I’m going with a minimal theme on my little girl’s nursery, so this fits that idea. Cute! This room gets my vote for favorite room. I also think it would be good for a little girl! Tiffany Thiessen did a great job with a touch of a retro 50’s vibe. I love this room design! Simple and not fussy; like. Tiffani Thiessen began her career as a model and caught her big break when she was just a teenager, landing a starring role on the sitcom Saved By the Bell. Thiessen has found continued success on the small screen and can currently be seen on USA Network's White Collar. An avid design enthusiast,Tiffani loves spending time with her artist husband and two year old daughter Harper.